I n one of the most elegant expressions of trickle-up fashion since the grunge movement, sneakers have become almost omnipresent in designer collections. From John Varvatos to Brioni, Cesare Paciotti to Saint Laurent, footwear is adapting to a more casual lifestyle, but also retaining a brand's essential DNA. At Los Angeles fashion and lifestyle brand James Perse, the addition of sneakers seems like a natural fit. "I saw a void between the traditional athletic brands and the high-end fashion footwear offerings, which we're seeking to fill with our new collections," says Perse. "We wanted to reinvent the classics with everyday wearability, quality and edge." This season, the brand introduced the So Cal collection, offering shoes "with a modern-stealthy vibe." At John Varvatos, the designer focused on finishes—easily setting his footwear apart. "Shoes from the collection are robust, featuring antiqued finishes and hand-applied treatments," explains Varvatos. "The collection achieves a genuine authenticity and continues in our theme of stylized audacity." Perhaps the greatest nod to the staying power and significance of the trend is its embrace by museums. "The Rise of Sneaker Culture," an exhibition that originated in Toronto at the Bata Shoe Museum, is on view at the newly opened Speed Art Museum in Louisville, Kentucky. "Increasingly, footwear is being charged with the responsibility of conveying complex and highly nuanced social meaning," says the show's curator, Elizabeth Semmelhack. "In this culture, sneakers are central to increasing diverse expressions of masculinism and are also central to expressions of individuality— something which men historically have not been encouraged to reveal through dress." "What we choose to wear and the impact of those choices are powerful components of design," said Sarah Schleuning, curator of decorative arts and design and managing curator of the summer show "The Rise of Sneaker Culture" at the High Museum in Atlanta. "The exhibition offered an in-depth exploration of the creativity and diversity of design within the singular typology of sneakers as well as the social significance of their evolution. The sneaker is a ubiquitous object that can be experienced and appreciated in a new way." Fashion bestows the power of gender expression, social status, futurism and even cultural affinity onto shoes in a democratic way. Semmelhack says, "The wide range of sneakers—from high-end collaborations to the resurgence of shoes like the Stan Smith that bring with them a kind of nostalgia— allows one to craft a very nuanced statement of self." 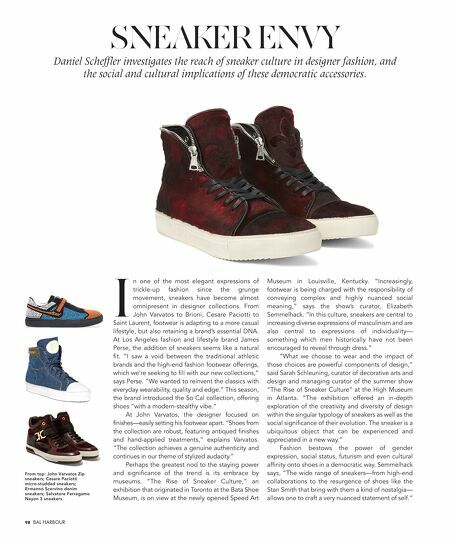 98 BAL HARBOUR SNEAKER ENVY Daniel Scheffler investigates the reach of sneaker culture in designer fashion, and the social and cultural implications of these democratic accessories. 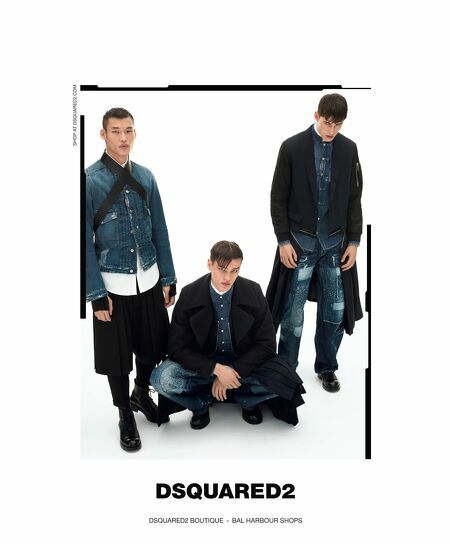 From top: John Varvatos Zip sneakers; Cesare Paciotti micro-studded sneakers; Ermanno Scervino denim sneakers; Salvatore Ferragamo Nayon 3 sneakers.